Put a large non-stick frying pan on medium heat and grease well. Make large circular pancakes about 25cm wide by ladling the mixture into the centre of the pan and spreading it into a large circle using a spoon or spatula. Combine the yeast, sugar, milk and water in a medium bowl. Set aside in a warm, draught-free place for 10 minutes, or until foaming. Combine the flour and salt in a large bowl. Make a well in the centre and add the milk mixture. Stir until well combined. Cover with plastic wrap and set aside for 1 hour or until mixture doubles in size. Combine the extra water and bicarbonate of soda in a jug. Use a balloon whisk to whisk the flour mixture until it deflates to the original size. Gradually add the water mixture, whisking well between each addition, until well combined and smooth. Cover with plastic wrap and set aside for 30 minutes to rest. Brush a large non-stick frying pan with oil to grease. Brush 5 egg rings with oil to lightly grease. Place frying pan over medium-low heat. Pour 2 tbs of mixture into the egg rings in pan and cook for 5 minutes or until bubbles rise to the surface and base is golden and top is set. Turn and cook for 1 minute or until lightly golden. Transfer to a wire rack. Continue in 2 more batches with remaining batter. Combine butter and honeycomb in a bowl. Toast crumpets and place on serving plates. Dollop with honeycomb butter and drizzle with honey. Serve immediately. Dissolve yeast in the warm milk, then leave to stand in a warm place until bubbling (about 10 minutes). Add egg yolks, butter, sugar, salt and vanilla to yeast mixture. Stir in the flour until batter is smooth. Fold egg whites into the batter; cover the bowl with a cloth and leave to rise until doubled in volume. Preheat the waffle iron.Brush with oil and spoon onto center of iron. In a large bowl, knead the dough 4-5 minutes. Dough will seem dry, do not be tempted to add fluids. Form a ball and cover with a towel, put aside, until double in size. 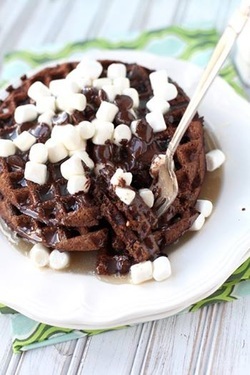 In a large bowl, beat together all ingredients for the waffles until smooth. Add enough milk to make the batter fairly thin, but not super runny. It shouldn't be thick and bloppy. Spoon into a hot waffle iron & bake according to mannufacturer instructions. In a large saucepan, combine all ingredients. Heat over medium high heat, stirring constantly until steaming hot. Spoon over fresh waffles, topped with mini marshmallows and chocolate chips. The syrup should be hot enough to melt the marshmallows & chocolate chips, so shy away from having it pretty danged steamy. In a large bowl, mix dry ingredients together. Set aside. mixture. Beat until blended. 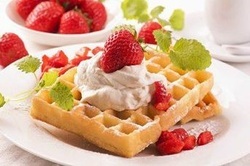 Ladle the batter into the preheated waffle iron. In large bowl, stir brownie mix, eggs and oil with whisk just until smooth. Pour slightly less than 3/4 cup batter onto center of hot waffle maker.